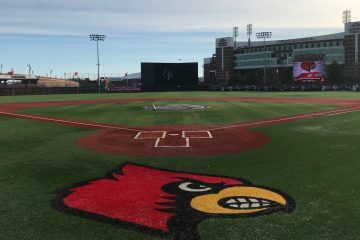 In the final game of the season before conference play fires up, the #8 Louisville Cardinals took on the Morehead State Eagles in a windy midweek affair, and exploded out of the gate to win 16-10. The first inning for the Cards was their highest scoring opening frame so far in this young season, with 5 runs plated in 10 at-bats. On top of piling on 16 runs on 21 hits, 4 separate Cards drove in their first career home runs. 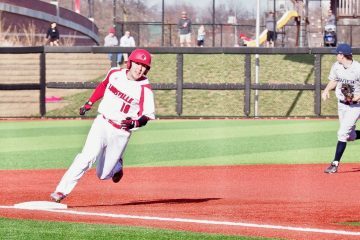 With an 11-0 record against Morehead State under Dan McDonnell and an 11-0 record on the 2018 season, Coach Mac’s goal to extend both undefeated marks to 12 games got off to a hot start, with the lineup card turning completely over in just the first inning. 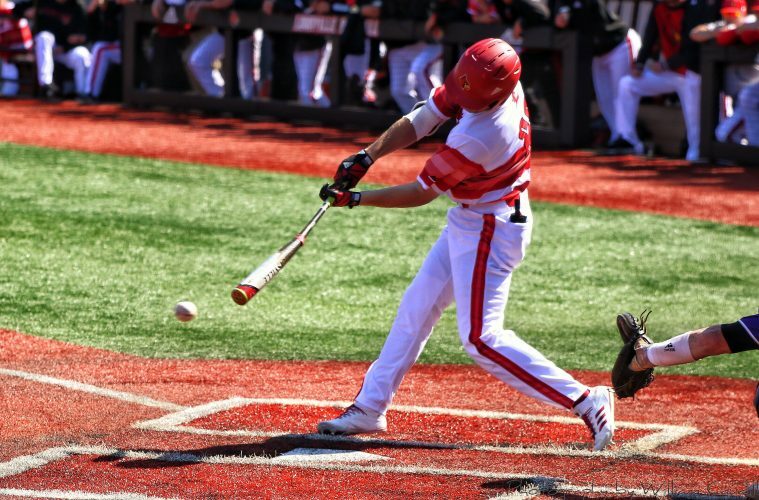 6 members of the Cardinal Nine reached base off a hit, with 3 of those being extra base hits including sophomore third baseman Justin Lavey’s 2 RBI triple. 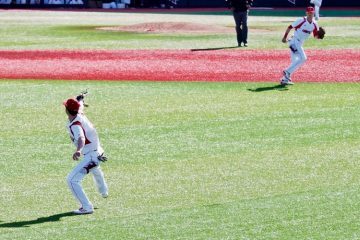 The only Cards to not reach base by either a walk or hit were outfielders freshman Drew Campbell and junior Josh Stowers, with Stowers recording the first and third outs of the inning. 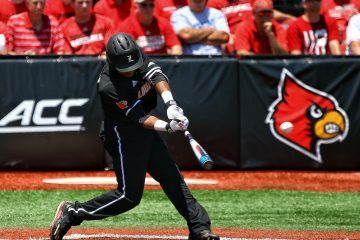 Even though the first inning has ended, Louisville carried on with their hot start to the contest. They plated an additional run in the second inning to make it 6-0, and then took back off in the third inning. 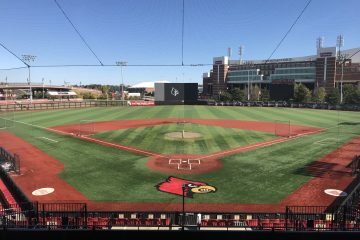 Freshman catcher Zach Britton and sophomore infielder Tyler Fitzgerald both connected on their first collegiate career home runs in back to back at-bats, with Fitzgerald’s moonshot completely clearing the berm. After a pair of walks by junior second baseman Devin Mann and first baseman Logan Wyatt, a throwing error by Morehead State following by a single off the bat of freshman outfielder Drew Campbell would push the lead to 11-1 after the end of three innings. 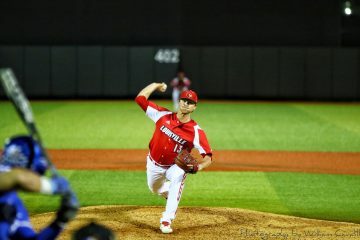 The early cushion provided by Louisville’s bats allowed starting pitcher junior right-hander Bryan Hoeing to pitch a little more loosely than a pitcher would normally be accustomed to. In his third start of the season, he was able to match his career high in strikeouts with 7 batters fanned despite allowing a 5 run fifth inning by Morehead State to cut the lead to 12-6 by the end of the fifth. Not to be outdone by seeing Zach Britton and Tyler Fitzgerald drive in their first career home runs, Logan Wyatt decided to join in on the party as well. With Devin Mann on base after a walk, he drove in the third Cardinal dinger of the day to make it a 14-6 through five. Despite still having 8 run advantage, Coach Mac decided he had seen enough of Hoeing and made it a bullpen game from here on out. Sophomore left-hander Adam Elliott would pitch a scoreless sixth inning, graduate transfer right-hander Austin Conway would pitch a 1 run seventh, and sophomore right-hander Austin Conway would make his 2018 debut in the eighth also surrendering only one run. 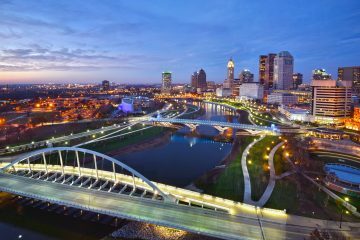 To help the bullpen out with their cause, Louisville still wouldn’t be done piling up the runs. Devin Mann would drive in an RBI single in the sixth, and in the seventh inning freshman backup catcher Ben Bianco would become the fourth Card of the game to drive in his first collegiate home run. His round-tripper would also be his first collegiate hit and permanently extend the lead to 16-8. To cap off the offensive show of force, sophomore right-hander Stewart Currie took the mound in the final frame, and Morehead State would make it interesting by bringing home a couple more runs. Freshman left-hander Michael Kirian would come into the game with runners on the corners and two outs, and record the final out with a K.